The warm tropical conditions of Truk Lagoon, its sheltering islands and reefs make it one of the most comfortably accessible wreck diving locations in the world. This sheltered part of Micronesia has wreck diving suiting all divers, from shallow snorkeling, down to deeper wrecks (still within recreational limits) for more advanced divers. There are minimal currents within the confines of Truk Lagoon and consistent good visibility, making the wreck diving easy and accessible for any diver. Penetrations and dive depths are nominated and customized to the comfort, needs and experience level of individual divers. We offer a range of [link id=40]courses[/link] onboard from open water through to Rescue. Plunge in to warm clear waters of Truk and discover the wonder-world of wrecks and treasures hidden below its smooth surface. Aboard Thorfinn you will never be far from any dive site, as the ship’s nearby anchorages provide great flexibility and convenient alongside diving. Running two custom designed fast dive launches along with two smaller craft, Thorfinn provides the most variety and accessibility to all of Truk, diving 30 or more wrecks in just one week aboard. It enables smaller groups and caters for specific needs of divers with extra requirements such as technical diving. Truk offers wrecks to suit any level of diver, from newly certified open water divers to more seasoned veterans, as depths are set by the individuals making the dives, yet we do have established guidelines and set safety standards. Some of our Guides, have been diving these wrecks for over 15 year and are the most experienced dive crew in the lagoon. They can hold hands with the newest divers, or permit more experienced divers to explore as they please. Diving conditions in Truk Lagoon are comfortably easy, with minimal currents, bath-like water temperature (29-30’C/84-86’F) and very good light. Anytime is ‘best’ time for diving here, as there are no real seasons. NE trade-winds from January to April create a cooling effect with a light sea chop. Rainfall is fairly consistent year round with short sharp showers followed by ample quantities of sun! High attractions of wrecked ships, planes, and a submarine, can be supplemented with occasional runs to pristine outer barrier reefs with bright corals, sharks, eagle rays, huge schools of barracudas, big eyed jacks, batfish and a profusion of reef fish! Shark feeding dives are an option at several locations. Neighboring island visits and tours are easily arranged as desired, without shipboard fees. Snorkelers or non-divers often accompany divers aboard dive launches, to view activities below, at many shallower dive sites scheduled daily. Regular charters run Saturday to Saturday throughout the year, with no person minimums to run a week’s tour, as we operate 52 weeks per year. 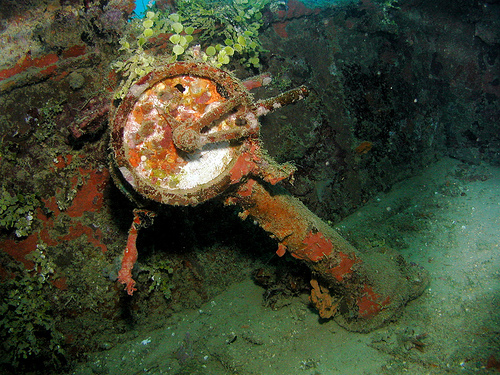 Technical divers have options of employing double banded manifolds with cylinders of 8 or 11 ltr sizes, and up to 15 ltr singles or sidemounts, 3-4 ltr pony bottles, stage cylinders, and special re-breather bottles with free Sofnolime, along with optional Helium that should be advance requested to ensure sufficient on-hand quantities. Aboard Thorfinn, you’ll receive rewarding experiences in technical diving with ability to extend diving at many deeper sites. Partial pressure blending via an efficient series of electric and air driven gas boosters produce various mixes of Enriched Air Nitrox and Trimix to meet individual requests. Thorfinn’s twin oxygen generators produce oxygen at 93% (+/-3%) purity, and along with imported Helium, make Thorfinn, a favored option for both re-breather and technical diving. Sofnolime is supplied freely on the Rebreather Plan. A selection of re-breather cylinders are available suiting most manufactured units, with all cylinders oxygen cleaned and compatible to industry standards.